2018 would see the French Grand Prix return to the Formula One calendar after a decade. The race has been a regular on the calendar since the first Formula One season in 1950, albeit for a break in 1955. The Grand Prix has been a racing event since 1906 and has been interchanged between 16 different circuits. While the Frenchman, Alain Prost held a special affection for the track, winning six times at three different circuits, it was the German, Michael Schumacher who was a complete master of the fixture, winning it a record eight times. This year, the French Grand Prix will be held at Circuit Paul Ricard which has already hosted the race 14 times previously between 1971 and 1990. The circuit has a knack for declaring Championship winners, six of the 14 winners went on to win one that year. Only two people who have conquered this French circuit have been unable to make claim to a Championship, Ronnie Peterson (1973-4) and René Arnoux (1982). After the Grand Prix shifted to Circuit de Nevers Magny-Cours, the Paul Ricard circuit was developed as a testing facility and is now recognized as one of the safest tracks on the map. The most distinguishing feature of the track has to be the application of black and blue paint as run-off areas in place of the typical gravel traps. The French Grand Prix has seen some exhilarating races over the years and we have attempted to trim the best from the rest. If any racing fan feels that there is not enough overtaking in today’s Formula One, all they need to do is watch the 1999 French Grand Prix to satiate their hunger. After seeing the official qualifying sheet, it is hard to imagine how the race ended up with the podium that it did. Mika Häkkinen showed a masterclass of overtaking, starting the race in the 14th position and ending up second. Even before the rain started falling, the Finnish driver was chasing down Rubens Barrichello for the win after passing Jean Alesi, Michael Schumacher, and Olivier Panis, among others. After the rain began to fall, everyone scrambled to the pits for a tyre change. The Finn then tried an overtaking maneuver on Rubens resulting in spinning and falling back down to the seventh position. The two-time World Champion made back all those positions by lap 60 and was in the lead when he pitted for fuel along with Rubens, leaving a clear field for Heinz-Herald Frentzen to take the win. 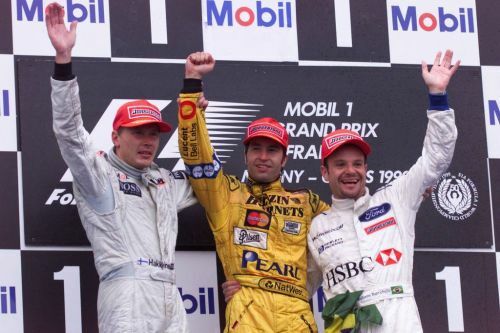 The race finished with only 11 drivers still running out of the 22 that had started and the podium comprised of Frentzen, Häkkinen, and Barrichello, in that order.